If you use the Novoflex adapter with the blue ring for aperture control, it matters not that there is no manual aperture control. I've used it on my Leica MP 240 with Pentax lens. I have a Kipon and two other adapters that have aperture control. 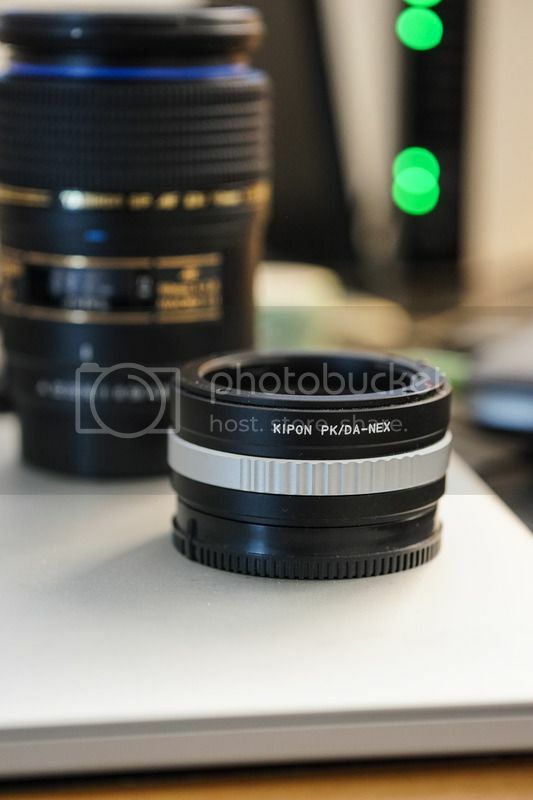 The Kipon adapter offers step-less turn for aperture control while the other pk-a adapter offers 5 steps aperture control. I am sure The Novoflex would be of better build and I wish to have a chance to try the Novoflex. Thanks for your inputs. I find it frustrating and slow, metering wide open, rotating the ring, tracking the exposure needle in the EVF until it's stopped down where I want it, then altering the shutter speed or ISO back to the right level. Points noted. Having the adapter is always a chore and it is no fun to see the bulk added by the adapter. In the case of FA 35, the adapter doubles the length for the lens. 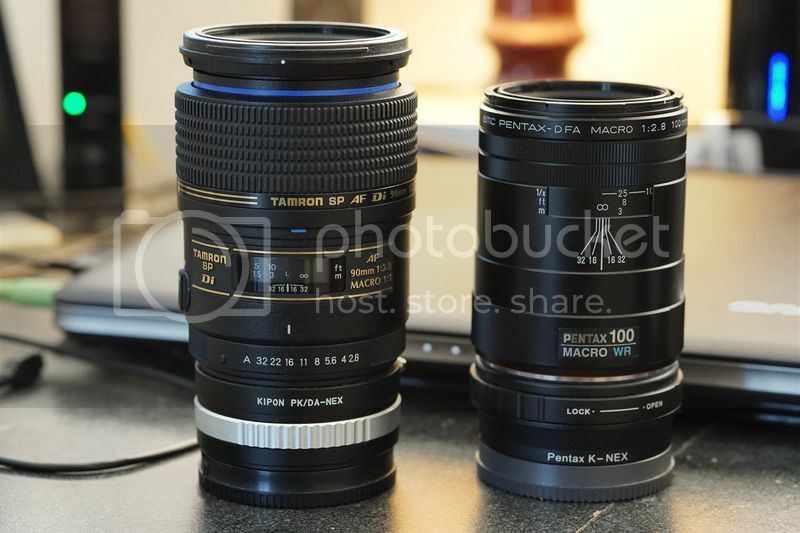 My Pentax DF-A 100mm f/2.8 Macro WR came quickly with 1-day free shipping from Amazon Prime. All the excitement comes to a plateau and now the grinding stays in selling lenses. The Pentax WR lens is real small, beautifully made and with 49mm filter size. The biggest mis-match is on the plastic hood which seems to be oversize for the lens. I may want to find a better matching metal hood that is smaller in size. I may wish to find enough differences and inconvenience that I may want to keep the Tamron for my Sony use as the focus limiter, AF/M toggle and aperture control on Tamron make it a better fit adapting to non-Pentax system. The Pentax WR is a perfect fit on my Pentax gear. Last edited by hinman; 01-24-2016 at 12:10 PM. Novoflex is stepless, and exceedingly well designed and built. It is expensive but I wouldn't put something cheap on my system. I am sure the Novoflex would be of better build and quality level. The Novoflex cost $279 while my Kipon cost about $100. Tamron 90mm macro is still available. Wish I can come up with valid reasons to keep both macro lenses. Last edited by hinman; 01-27-2016 at 04:58 AM. Yeah, the Novo is spendy but I wanted to make sure I used a well made adapter on my Leica. That Kipon looks nice but I'm not familiar with them. Price is reduced from $225 to $209. Interested in the Macro if my taxes come back in soon. Also debating on the WR myself but either would probably be fine. Great macro lens (see my shots with it). Free bump. You have beautiful and amazing pictures using the Tamron macro. Thanks for sharing. I am also surprised this Tamron 90 is still available. I loved mine. I don't care about WR as I don't shoot in the rain, and they make camera condoms if I wanted to. Thanks! Lens is still available.